John Paul II’s writings on this topic “Original Unity of Man and Woman” “Familiaris Consortio” and “Letter to Families,” presented the family as rooted in the economy of salvation: God's act of creating the world and offering salvation through Christ—with an important role to play in the order of redemption. The family, as such, must continue the work of Christ and this work must begin first within itself, within each individual family before flowing outward to the extended community. John Paul wished for us to understand the truth about ourselves and not settle for reductions of our personhood. Marriage faces the same reductionist onslaught which assails us, and this is the reason, in an era of anthropological confusion—who and what is a man and a woman? - that marriage between the two is under attack. Without a proper understanding of who we are, the purpose and meaning of marriage cannot be understood in its fullness. The “future of evangelization,” insisted St. John Paul, “depends in great part on the Church of the home” (Familiaris Consortio 52). In Redemptor Hominis, he wrote that “the missionary attitude always begins with a feeling of deep esteem for what is in man” (RH 12). In a seemingly radical statement John Paul proclaimed that “Man is the primary and fundamental way for the Church, the way traced out by Christ Himself, the way that leads invariably through the mystery of the Incarnation and Redemption” (RH 14). In his 1994 “Letter to Families”, he repeated this theme, stating that “Christ entrusted man to the Church; he entrusted man to her as the way of her mission and ministry. The lingering question for John Paul II was this: How can the family begin to evangelize and build a civilization of love? He notes that in order for the family to be a sign of Christ’s presence in the world and to take up its mission as evangelizing community, each member of the family, particularly the spouses, must end the reign of sin in their lives (cf. FC 63). You cannot bear fruit if you are severed from the vine, you cannot give what you do not have. In order for the family to participate in this task it has to be constantly nourished and sustained at the wellspring of grace in the Liturgy. Furthermore “the little domestic Church, like the greater Church, needs to be constantly and intensely evangelized: hence its duty regarding permanent education in faith” (FC 51). John Paul II left us with a rich, impressive, profound and lofty theology of marriage and family life. His vision flowed from the inherent dignity of every man and woman, of every human being. Some people may be intimidated by John Paul’s reflections, seeing them as daunting, too philosophical and overly academic. Yet, despite the scholarship and depth of his writing, Pope John Paul II had no intention of having his teachings about the human person remain only on the academic level. I think you will agree that his reflections are deeply Christological and Trinitarian, and they are meant to change lives. Let us consider how Pope Francis is opening up the theological vision of his two immediate predecessors. In his first apostolic exhortation, on “The Joy of the Gospel,” Pope Francis takes the magnificent theology of John Paul II and Benedict XVI and shows us how to apply it in the trenches, in the peripheries of ordinary, daily life. This application is not without immense challenges. “The process of secularization tends to reduce the faith and the Church to sphere of the private and personal. Furthermore, by completely rejecting the transcendent, it has produced a growing deterioration of ethics, a weakening of the sense of personal and collective sin, and a steady increase in relativism” (64). 66. (EG) The family is experiencing a profound cultural crisis, as are all communities and social bonds. In the case of the family, the weakening of these bonds is particularly serious because the family is the fundamental cell of society, where we learn to live with others despite our differences and to belong to one another; it is also the place where parents pass on the faith to their children. Marriage now tends to be viewed as a form of mere emotional satisfaction that can be constructed in any way or modified at will. But the indispensible contribution of marriage to society transcends the feelings and momentary needs of the couple. He also called on participants in the Colloquium “to lift up yet another truth about marriage: that permanent commitment to solidarity, fidelity, and fruitful love responds to the deepest longings of the human heart.” This is especially important for young people “who represent our future.” Finally, Pope Francis said the family is not an ideological concept, but an “anthropological fact.” That is, the family is not a “conservative” or a “progressive” notion, but is a reality that transcends ideological labels. During his recent trip to Manila, Francis held a meeting with 20,000 Filipino families in which he blasted the “ideological colonization” of the family. It refers to the strongly held belief among many Catholics in places such as Africa, Latin America, and Asia that Western governments and NGOs, as well as international bodies such as the United Nations, are using their control over development aid to impose their agendas. That same night in Manila, Francis again departed from his prepared text to offer a strong defense of Pope Paul VI and his controversial 1968 encyclical Humanae Vitae that upheld the contraception ban. On the return flight from Manila to Rome, Francis gave a long answer to a question asked of him about the meaning of ideological colonization. He told a story from his time as an Argentinian bishop about a government education minister needing a loan to build schools for the poor, and getting an offer on the condition that textbooks in these schools contain references to “gender theory.” This phrase refers to the idea that sexual identity is a social construct, not part of any natural law, and thus all types of sexual orientations and behaviors are perfectly acceptable. Francis described this colonization as an assault on the right of peoples to make their own choices and to preserve their own identity. Some headlines from that in-flight news conference focused on the pope’s green light to limit the size of Catholic families, in part because he served up an irresistible sound-bite: “To be good Catholics, we don’t have to breed like rabbits.” Yet as insiders parse the pope’s words, they’ll discover that he was in no way talking about contraception, since he once again praised Paul VI and even said that Pope Paul was trying to ward off a “neo-Malthusian” ideology of population control. Pope Francis and Cardinal Kasper maintain the full teaching of the Church but the teaching has to be applied to concrete situations, as Jesus did and as Pope Francis does very often. The doctrine of the Church is not an ideology in the clouds. It's about a God who wishes to be present and close to his people. Since the topic of this presentation is about challenges facing marriage and family life. I would like to propose to you several Scripture passages for your consideration. Passages which remind us that though we should strive for the highest ideals, we must also recognize and accept people where they are at. Matthew’s infancy narrative (1:1-25), provides a wide-angle view of the Incarnation event, against a rich, biblical panorama. More than Mark and Luke, Matthew stresses the Jewish origin of Jesus: the genealogy presents him as “son of David, son of Abraham” (1:1) and goes back no further. Matthew is concerned with 14 generations, probably because 14 is the numerical value of the Hebrew letters forming the name of David. While the genealogy shows the continuity of God’s providential plan from Abraham on, discontinuity and irregularity are also present. The women Tamar (1:3), Rahab and Ruth (1:5), and the wife of Uriah, Bathsheba (1:6), bore their sons through unions that were in varying degrees strange and unexpected. These “irregularities” culminate in the great “irregularity” of the Messiah’s birth of a young virgin. Matthew has drawn our attention to the peculiarities of these biblical women of the Old Testament, perhaps in order to warn us that something even stranger is coming, or perhaps to enable us, when the news is announced, to connect it with God’s strange way of operating in the past. Our God writes straight with crooked lines, and Jesus’ genealogy is living proof of that fact! 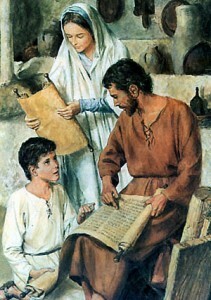 Matthew’s story is told from Joseph’s point of view, while the more familiar account from Luke is told from the perspective of Mary. Joseph, a righteous man, is presented as a devout observer of the Mosaic Law (1:19). His betrothal to Mary was the first part of the marriage, constituting a man and woman as husband and wife. Subsequent infidelity was considered adultery. Some months after the betrothal, the husband would take his wife into his home, at which time normal married life began. Joseph’s decision to divorce Mary is overcome by the heavenly command that he take her into his home and accept the child as his own. The natural genealogical line is broken, but the promises to David are fulfilled; through Joseph’s adoption the child belongs to the family of David. Joseph protected and provided for Jesus and Mary. He named Jesus, taught him how to pray, how to work, how to be a man. While no words or texts are attributed to him, we can be sure that Joseph pronounced two of the most important words that could ever be spoken, when he named his son “Jesus” and called him “Emmanuel.” At Christmas Eve each year, it becomes clear to us that the story of the birth of a baby in Bethlehem was no idyllic country folk tale. It was the true fulfillment of the hopes and longings, dreams and desires of the people of ancient Israel. What do we learn from this powerful story of Jesus’ origins? God never abandons humanity, but rather enters into all that frequently makes life on earth so difficult. In the name “Emmanuel,” we find the answer to humanity’s deepest longings for God throughout the ages. Emmanuel is both a prayer and plea on our behalf, and a promise and declaration on God’s. When we pronounce the word, we are really praying and pleading: “God, be with us!” And when God speaks it, the Almighty, Eternal, Omnipresent Creator of the world is telling us: “I am with you” in this Child. The name Emmanuel is also alluded to at the end of Matthew’s Gospel where the Risen Jesus assures his disciples of his continued presence: “I am with you always, until the end of the age” (28:20). There is a Gospel story unique to Luke (2:41-52) that relates an incident from Jesus’ youth. Luke’s infancy narrative, however scarce in details concerning the first part of Jesus’ life, mentions that “his parents went to Jerusalem every year at the feast of the Passover” (2:41), an indication of their piety, and of their fidelity to the law and to the tradition of Israel. “When Jesus was 12 years old, they went up according to custom. When they were returning, the boy Jesus stayed behind in Jerusalem, without his parents knowing it” (2:42-43). After searching for three days, “they found him in the temple, sitting among the teachers, listening to them and asking them questions” (2:46). Jesus’ mysterious words to his parents seem to subdue their joy at finding him: “How is it that you sought me? Did you not know that I must be in my Father’s house?” (2:49) The later question can also be translated, “Did you not know that I must be immersed in my Father’s work?” In either case, Jesus refers to God as his Father. His divine sonship, and his obedience to his heavenly Father’s will, take precedence over his ties to his family. Apart from this event, the whole period of the infancy and youth of Jesus is passed over in silence in the Gospel. It is the time of his “hidden life,” summarized by Luke in two simple statements: Jesus “went down with [Mary and Joseph] and came to Nazareth, and was obedient to them” (Luke 2:51); and “He progressed steadily in wisdom and age and grace before God and men” (Luke 2:52). With this episode, the infancy narrative ends just as it began, in the setting of the Jerusalem Temple. We learn from the Gospels that Jesus lived in his own family, in the house of Joseph, who took the place of a father in regard to Mary’s Son by assisting and protecting him, and gradually training him in his own trade of carpentry. Indeed, the people of the town of Nazareth regarded him as “the carpenter’s son” (Matthew 13:55), asking with surprise: “Is not this the carpenter, the son of Mary?" (Mark 6:3). Besides his mother, they mentioned also his “brothers” and his “sisters,” who lived at Nazareth. It was they who, as the evangelist Mark mentions, sought to dissuade Jesus from his activity of teaching (Mark 3:21). Evidently, they did not find in him anything to justify the beginning of a public ministry. They thought that Jesus was just like any other Israelite, and should remain such. Does the story sound familiar? The anxiety and misunderstanding experienced by the Holy Family should not be hidden from families today that experience similar situations. We have often presented the Holy Family of Nazareth as the picture perfect snapshot of family life, without any blemish or difficulty. When we connect people with the real, daily life situations of the Holy Family, and allow the utter humanity of Mary, Joseph and Jesus to shine through, contemporary families will look to them for inspiration, intercession and hope. It was through the irregularity at the beginning, ordinary daily living, and daily acts of faithfulness, kindness, generosity and love that surrounded Jesus, the Son of God and the Son of Mary, that provided for him a beautiful environment in which to grow and mature. Holiness flows from wholeness and goodness. Nazareth is a kind of school where we may begin to discover what Christ’s life was like and even to understand his Gospel. Here we can observe and ponder the simple appeal of the way God’s Son came to be known, profound yet full of hidden meaning. First we learn from its silence. If only we could once again appreciate its great value. We need this wonderful state of mind, beset, as we are, by the cacophony of strident protests and conflicting claims so characteristic of these turbulent times. The silence of Nazareth should teach us how to meditate in peace and quiet, to reflect on the deeply spiritual, and to be open to the voice of God’s inner wisdom and the counsel of his true teachers. Nazareth can teach us the value of study and preparation, of meditation, of a well-ordered personal spiritual life, and of silent prayer that is known only to God. Second, we learn about family life. 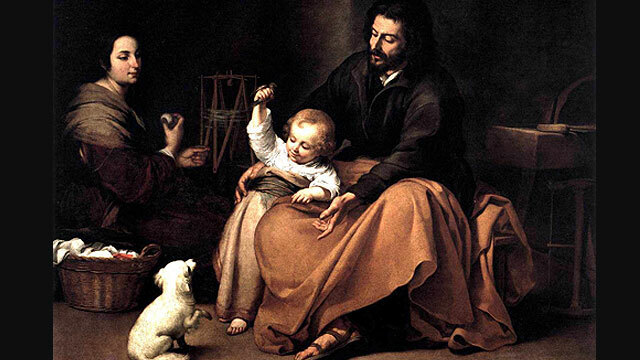 May Nazareth serve as a model of what the family should be. 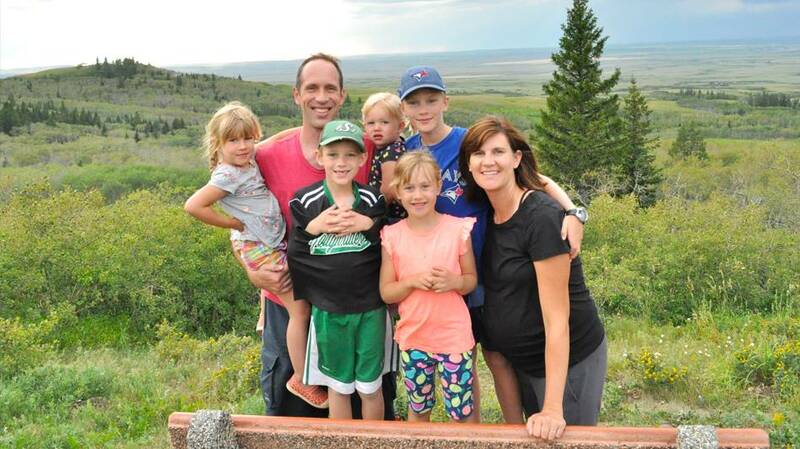 May it show us the family’s holy and enduring character and exemplifying its basic function in society: a community of love and sharing, beautiful for the problems it poses and the rewards it brings – in sum, the perfect setting for rearing children – and for this there is no substitute. Finally, in Nazareth, the home of a craftsman’s son, we learn about work and the discipline it entails. I would especially like to recognize its value – demanding yet redeeming – and to give it proper respect. I would remind everyone that work has its own dignity. On the other hand, it is not an end in itself. Its value and free character, however, derive not only from its place in the economic system, as they say, but rather from the purpose it serves. As bishops, priests and the entire Christian community, and as society in general, we must do more to encourage the committed relationship of man and woman that remains so basic to all civilizations, and has proven to be the best support for the rights and needs of children. The Christian family is no longer capable of singularly transmitting the faith to the next generation, and neither is the parish, even though it continues to be the indispensable structure for the Church’s pastoral mission in any given place. As the keystone of society, the family is the most favorable environment in which to welcome children. We must reflect carefully on the social consequences involved in the redefinition of marriage, examining all that is entailed if society no longer gives a privileged place and fundamental value to the lifelong union of a man and a woman in matrimony. Care must be taken with the language we use to describe these consequences. Parishes, dioceses, and lay movements that do not have creative pastoral strategies and vocational programs about marriage for young people leave the door open to tremendous moral confusion and misunderstanding, misinformation, emptiness. At the same time, we cannot forget that other bonds of love and interdependency, of commitment and mutual responsibility exist in society. They may be good; they may even be recognized in law. They are not the same as marriage: they are something else. No extension of terminology for legal purposes will change the observable reality that only the committed union of a man and a woman carries not only the bond of interdependency between the two adults, but the inherent capacity to bring forth children. “The future of humanity passes through the family,” as Saint John Paul II would say so often. The foundation of society is the family. And the foundation of the family is marriage. The vocation to marriage is written in the very nature of man and woman. The family is the most favorable environment in which children can be born and raised. We need young adults to say “I do” with joy, conviction, faith, and hope. They are our future and our hope. Without married people, we cannot build the future of society and the Church. Without committed, married people, our world will not give rise to the holy families of today. The institution of the family faces great challenges in various parts of the world today, and it is entirely appropriate for the homilist to speak about these. However, rather than simply giving a moral exhortation on family values, the preacher should take his cue from the Scripture readings of this day to speak of the Christian family as a school of discipleship. Christ, whose birth we are celebrating, came into the world to do the will of his Father, such an obedience that is docile towards the movements of the Holy Spirit has a place in the life of every Christian family. 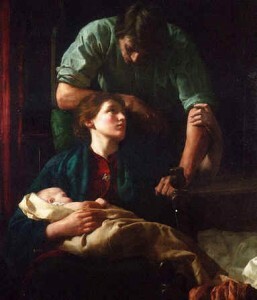 Joseph obeys the angel and takes the Child and his Mother into Egypt (Year A); Mary and Joseph obey the Law by presenting their Baby in the Temple (Year B) and going on pilgrimage to Jerusalem for the feast of Passover (Year C); Jesus for his part is obedient to his earthly parents, but his desire to be in his Father’s house is even greater (Year C). As Christians, we are also members of another family, which gathers around the family table of the altar to be fed on the sacrifice that came about because Christ was obedient unto death. We should see our own families as a domestic Church in which we put into practice the pattern of self-sacrificing love we encounter in the Eucharist. 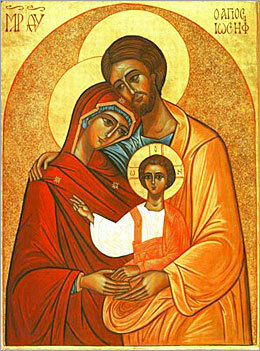 Thus all Christian families open outward to become part of Jesus’ new and larger family: “For whoever does the will of God is my brother and sister and mother” (Mk 3:35). This understanding of the Christian meaning of family life assists the preacher in speaking about the reading from St. Paul’s Letter to the Colossians. The Apostle’s instruction that wives should be subordinate to their husbands can be disturbing to people of our day; if the homilist does not plan to speak about this directive, it might be more prudent to use the shorter version of the reading. However, the difficult passages of Scripture often have the most to teach us, and this reading provides an opportunity for the homilist to address a theme that may be uncongenial to modern ears, but which in fact does make a valuable and necessary point when properly understood. We can gain insight into the meaning of this text by consulting a similar one, Eph 5:21-6:4. There also Paul is speaking about the mutual responsibilities of family life. The key sentence is this: “Be subject to one another out of reverence for Christ” (Eph 5:21). The originality of the Apostle’s teaching is not that wives should be submissive to their husbands; that was simply presumed in the culture of his day. What is new, and distinctively Christian, is, first, that such submission should be mutual: if the wife is to obey her husband, the husband in turn should, like Christ, lay down his very life for his wife. Secondly, the motive for this mutual subordination is not simply for the sake of harmony in the family or the good of society: no, it is made out of reverence for Christ. In other words, mutual submission in the family is an expression of Christian discipleship; the family home is, or should be, a place where we manifest our love for God by laying down our lives for one another. The homilist can challenge his hearers to make real in their own relationships that self-sacrificial love which is at the heart of Christ’s life and mission, and which we celebrate in our “family meal” of the Eucharist. We need new strategies, new language, and creative pastoral outreach to encourage young adults to consider sacramental marriage and family life. We must develop better methods of evangelization and catechesis to convince young adults that marriage is good, beautiful and worthwhile! We must discover new avenues of communication and outreach to those recently married. What do we provide for them? How do we thank the thousands of couples who, day in and day out, before our very eyes, lay down their lives for others and serve the Lord and their families with great generosity. And let us never forget those who have loved and lost, and those who have suffered the pain of separation, divorce and alienation. May our field hospitals provide for them healing, consolation and loving welcome. Pope Francis reminds us each day in word and by his actions of the importance of being close to people and accompanying them along the way. In Evangelii Gaudium, Francis devotes much attention to the homily at mass. I consider this a brilliant pastoral strategy to reach people today and let them know of the beauty of marriage and family life. “When Jesus preached he looked beyond the weaknesses and failings of the people. He preached with mercy and kindness. He was filled with the joy of the spirit. He preached the truth with the beauty of images."